This blog is supposed to be about making connections.. Lately it’s felt more like a hodgepodge, just a collection of unrelated posts. This blog is certainly challenging me to live out what I preach: living life in a single flow. This weekend however, it suddenly got a lot easier. I was blessed to attend two extraordinary events which practically shouted “Connections! Connections!” to me. The pen couldn’t move fast enough across the page of my notebook to capture all I was hearing so I could share it with you. I will begin with this past Sunday night. I teach CCD to high school students and needless to say, it is a challenge. Instead of our normal class last night, the students were treated to a one-man play about the Gospel of St. Luke. It was written and performed by Frank Runyeon. But Frank would rather be associated with the art closest to his heart: spreading the Good News of Jesus Christ through his vibrant performance of the Gospels. He debuted his latest one-man play, “Luke, Stories on the Road” at the parish to which I belong, St. Luke the Evangelist in Westborough, MA. I came with low expectations. I’m not a big movie-goer nor have I seen a lot of live plays. I had had a fight with my husband, was blown-out from a weekend of endless activity and just wanted to crawl under the covers. So it took a bit of time to warm up. About a half hour into the performance I felt a sudden urge to whip out my notebook and write. Frank spoke and I’d write. His performance became riveting. The camera soon followed. As a former girl scout, I am always prepared! 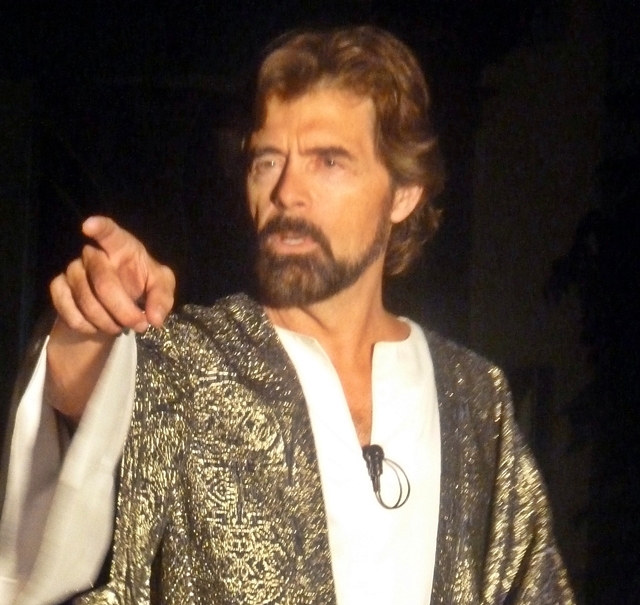 Dressed in a simple robe, Frank wove stories from the Old and New Testament, focusing first on the story of King David and his disastrous affair with Bathsheba and moving into the stories of Jesus as recorded by Luke the Evangelist. In each story, he shared a similar and striking insight: the stories, in many cases, had open endings. The reason? WE are the ending to the story. How can that be? These stories are thousands of years old. But inspired by the Spirit of the Living God, their truths are as pertinent today as they have ever been. And Frank made the scriptures come alive with his talented way of weaving a tale. Past and present – another connection. Frank made an important association between the story of King David and Bathsheba (2 Samuel 11; 2 Samuel 12) and the parable of The Rich Man and Lazarus found in Luke 16:19-31. In the story of King David, Bathsheba found she was pregnant after their affair. To cover up their relationship, David arranged to have her dutiful warrior husband killed in battle (2 Samuel 11). Nathan the prophet was sent by the Lord to point out David’s sin (2 Samuel 12) and he did it through a heart-wrenching tale of a rich man robbing a poor man of his only lamb who had been a member of the family so that he could roast it for his friends. David was incensed. Who was that man? He should be punished! It was then that Nathan turned the story around on David, using it to accuse him before God of his sin. Frank put out the palm of his hand: the story was a mirror clearly showing David’s guilt. David listened, made the connection and repented of his sin. 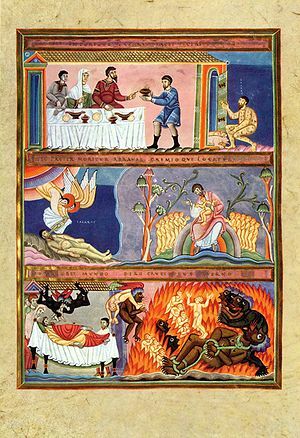 The rich man did the same with poor Lazarus, committing evil against him by not offering him food or comfort as the poor man suffered outside the door of his home. When both died, Lazarus, in the bosom of Abraham became the mirror to the rich man in agony in Hades. The rich man listened but too late: he must suffer the consequences. The rich man had Moses and the Prophets, but he didn’t listen. He failed to make the connection. Frank shared many such stories from the Gospel of St. Luke, the most powerful being The Prodigal Son (Luke 15:11-32) and The Publican and the Tax Collector (Luke 18:9-14). In both cases we are most definitely the end of the story. And it’s not the character that you would imagine. 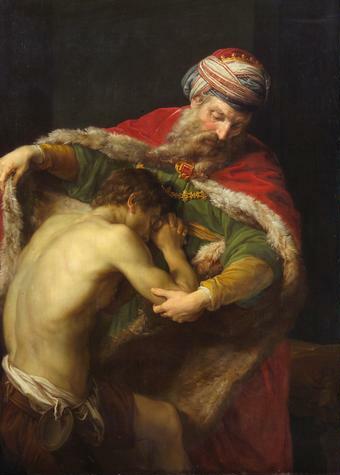 Frank beautifully conveyed the deep emotion in the story of Prodigal Son, showing the arrogance, ignorance and finally, redemption of the younger son, the deep, generous love of the father, and the bitter resentment of the older son. The father and the younger son reconciled. The older son, faithful in service to his father, complained, feeling entitled to better treatment. And as Frank pointed out, the ending with the “good” son was open-ended. The “good” son is us. We have to create our own ending. The same was true with the Publican and the Tax Collector. Both praying in the temple, the Publican pontificating before God about how much he tithed and how much better a person he was than the wretched Tax Collector. The Tax Collector, knowing he was an outcast in Jewish society, never raised his eyes to God but begged forgiveness. He was justified. The “good” Publican was not. And the mirror shines back on us – are we that Publican? Frank Runyeon, through his vibrant, deeply emotional performance, demonstrated the deep connection of the Living Word of God to our daily lives. We at St. Luke’s were fortunate to have him tell these stories, opening our ears and eyes, helping us to listen and make those connections. 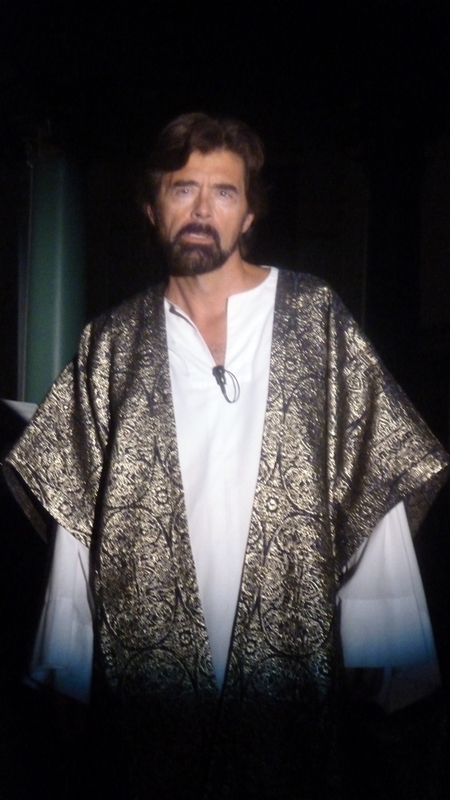 Frank is available for bookings throughout the country with “Luke: Stories from the Road” and other biblical one-man plays, all written by him. Visit his website at frankrunyeon.com.